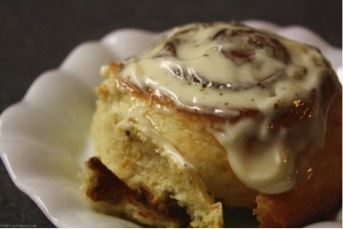 Nothing's better than waking up to the scent of fresh-baked cinnamon rolls. And fall and winter are the perfect seasons for this kind of baking. But a lot of readers ask for help in forming and baking them. So with that in mind, here are foolproof tips for the BEST sweet rolls (they work for anything from apple and walnut rolls to classic pecan sticky buns). Most of this instruction was found on allrecipes.com, and we thank them for their expert help. 1. Prepare the yeast dough. After it rises once, turn it onto a lightly floured surface. Flatten the dough with the palms of your hands and gently stretch and/or roll it into a rectangle. 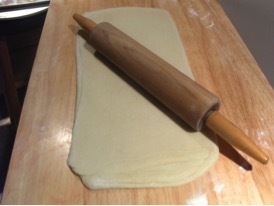 Use a rolling pin to roll the dough out into a larger rectangle, approximately 12 inches wide by 20 inches long. The dough might be sticky, so flour the work surface and the rolling pin, checking to be sure the dough isn't stuck to the work surface and adding more flour as necessary. 3. Spread softened butter over the surface of the dough, leaving a 1-inch strip along the long edge of the rectangle furthest away from you completely dry. 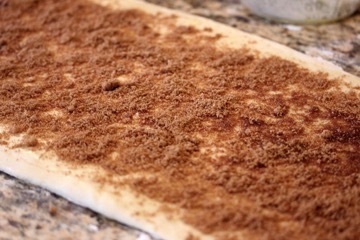 Generously sprinkle cinnamon-sugar over the butter, spreading the mixture evenly across all the dough. Tip: Adding a pinch of ground cloves to the cinnamon-sugar mixture enhances cinnamon flavor. Leave the 1-inch border free of sugar. 5. Add other desired fillings (raisins, nuts, shredded coconut, orange zest, etc. ), taking care to distribute them evenly. 5 Star Tips: 1) My gourmet neighbor slathers a THICK coating of Nutella across her sheet of roll dough, instead of butter. She says this creates amazing flavor and efficiently anchors her fillings in place. 2) My Aunt Annie loved to cover her sheet of rolled dough with a ½-inch layer of sweetened cream cheese that had been flavored with lots of orange juice concentrate and orange zest. Oh my. Start at the left-hand corner of the edge closest to you. Working from left to right, tug the lip of the dough up and over the filling, keeping it tight. Roll up the dough, tightening the log as you go. 7. 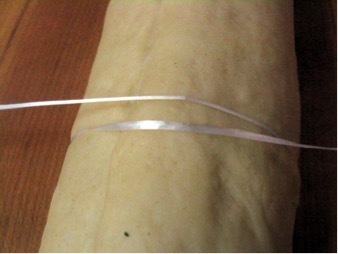 When you reach the far edge of the dough, moisten the bare edge with egg wash or water; pinch to seal the seam. You probably already know, but the best way to slice roll dough is with dental floss. 9. Place cut rolls on a greased or parchment-lined baking sheet. 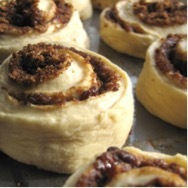 (For sticky buns, prepare the pan with the cinnamon smear and chopped pecans before arranging the rolls. For pull-aparts, arrange rolls 1 inch apart. For individual rolls, space them 2 to 3 inches apart.) Cover rolls with a damp cloth; let them rise until nearly double in size, about 45 minutes to an hour. You can also cover them with plastic wrap and refrigerate them. The next morning, let the rolls rise at room temperature until doubled, then bake as directed. (The unbaked dough can also be frozen for two weeks to one month. Then thaw at room temperature (still wrapped), let rise until doubled and bake as directed. 11. After approximately 15 minutes, test for doneness, using a knife or fork to pull up the center-most roll; if the dough is still sticky and raw-looking, return the pan to the oven for about ten more minutes. They should be golden to dark brown on top, and fully baked in the center of the coil. Let rolls cool 10 to 15 minutes before frosting.